Earthquake Research Center to provide more detailed information. March. 23, 2018 07:58. kyungeun@donga.com. 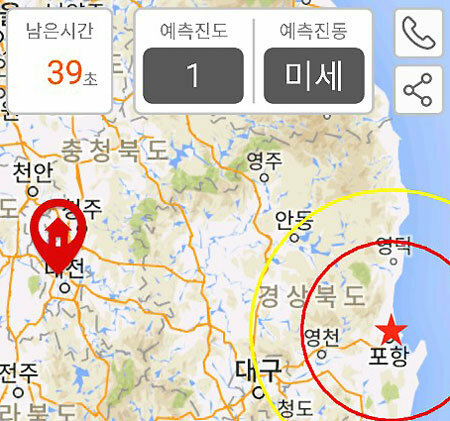 “11-15 14:29 6 km north of Buk-gu, Pohang City, North Gyeongsang Province, 5.5 magnitude earthquake occurrence / aftershock. Please take caution.” This is the content of the emergency text alert sent by the Korea Meteorological Administration when an earthquake broke out in Pohang last November. Given that the text only includes information on the time, location and the absolute magnitude of the earthquake, it is difficult for people who receive the text to find out when and how strong of an earthquake is heading towards them at their location. The Earthquake Research Center under the Korea Institute of Geoscience and Mineral Resources recently developed the “Hybrid Earthquake Early Warning (EEW)” system, which provides information based on facilities in a certain region rather than the place an earthquake took place as well as a smartphones application for alarming earthquakes at its early stage. This application also provides information based on the user’s location, such as expected seismic vibration and the degree of damage (magnitude), the amount of time left until the earthquake reaches the user and actions to take. People will be able to make on-site reports while gaining detailed information regarding the concerned earthquake. The Hybrid EEW System is carried out by converging data that are collected autonomously in facilities of a region with the central network, which senses earthquakes through national earthquake observatories. “Even if the magnitude of the earthquake is the same, the degree of seismic vibration varies according to the distance from the epicenter, the characteristic of the ground, and the height of a building,” said Park Jeong-ho, a senior researcher of the Earthquake Research Center. “Citizens want to know quake damage on the place they are standing.